While the lazy, hazy days of summer are spreading gloriously in front of us, some thoughts may be turning to a few good books to enjoy in the back yard, the camp site or the cottage. To help make the choice a little easier, I asked Fiona Nelson to name her three favourite books. Here’s what she had to say: “In these times when greed and individualism seem to be the rule, reading these books will help teachers defend their work. The writers offer a rationale for maintaining a holistic society that cares for its most vulnerable citizens. This kind of summer reading might not be the lightest fare available. However, if you enjoy short, well-written books that restore your faith in human nature, these may well be the books for you. They are probably all available from your local public library. If all three would be too much, pick your favourite and enjoy it. While the books recommended are all non-fiction, Nelson’s favourite fiction authors include Margaret Atwood, Timothy Findlay, Doris Lessing, Rohinton Mistry and Vikram Seth. “These authors have all left indelible images in my mind,” she says. 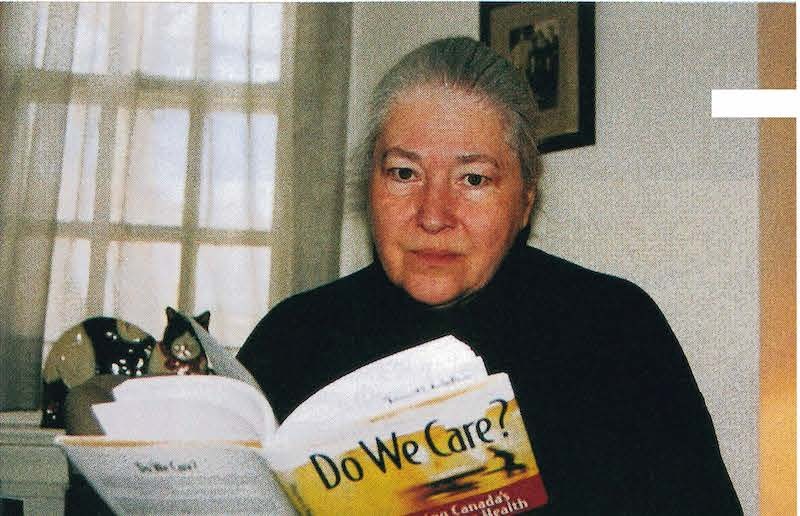 Fiona Nelson taught kindergarten in Toronto for 10 years throughout the 1950s and 1960s. She also taught Early Childhood Education at George Brown College and served as a school trustee (including Chair of the Toronto Board of Education) for 23 years. She is currently a member of the City of Toronto's. Children's Action Committee and the Toronto Board of Health's Food Policy Council. Charlotte Morgan is the Editor of the ETFO Voice. Ignatieff, Michael. The Needs of Strangers: An Essay on Privacy, Solidarity and the Polities of Being Human , Penguin Books Ltd. 1984. 156 pages includes notes and index. Somerville, Margaret A., Editor. Do We Care? Renewing Canada's Commitment to Health Proceedings of the First Directions for Canadian Health Care conference. McGilLQueen's University Press. Merck Frosst Canada Sc Co. 1999. 166 pages. As teacher-librarians, we collaborate with our classroom teachers to identify students who are reading at an independent level, and who could benefit from an enriched reading program. One such program is the Ontario Library Association’s Silver Birch Reading Award.